On live, increased bait duration is no longer a hidden trait. 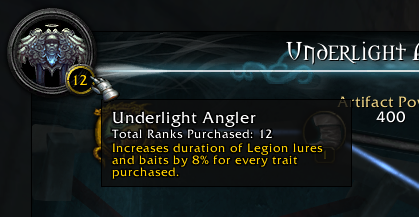 Mousing over the trait count shows Increases duration of Legion lures and baits by 8% for every trait purchased. Doesn't seem to extend Appât arcanique duration. One Oodelfjisk school in Stormheim is at 46.4,63.2 (right south-east of Cullen's Post, nearby the waterfall). Of course you have to use Ancienne bague vrykule first to see it. I would also advise to use Appât arcanique while fishing to get additional Ancienne bague vrykule and other baits. Caught my first Sang de Sargeras yesterday in Suramar with a level 13 pole, puts my personal droprate at around 1 in 200 casts, perhaps more. It was from a Koi pool, I didn't have an Arcane Lure active. If you happen to have any excess Murloc endormi from your rare fishing hunt in order to get the artifact do not use it! It doesn't matter if you fished it with a plain rod, once you set the murloc free while having the artifact equipped it will drop for you the upgraded version of Poisson-globe sage-épine that gives you AP! Essentially you get immediately the first trait without having to go fish and come back and learn it from the fountain, saves a bit of time. I tried fishing Talang fantomatique in Azsuna and I got around 40 of them per 1 lure. But I didnt get the Broche à talangs rouillée everytime it wore off. It was a bit frustrating. Tried another method and it worked pretty great. Some stats of my Pêcheur de Terradiance. You need Mouche vorace and unlocked Surface Tension on your Pêcheur de Terradiance so you can avoid some mobs and optional Appât arcanique, Azure Water Strider, Anglers Fishing Raft. I tried two runs with and without Appât arcanique. I start in Suramar at around /way Suramar 84.7 55.2 and move towards Jandvik and fish out of all Black Barracuda Schools that are along the way. Just run along the coast until the Mouche vorace wores out. Good thing about barrels is that if you get x2 Requin en colère étourdi you can loot one of them and the barrel will stay there. So you can kill the first shark and loot the other one from the barrel. I know you have to run around a bit more than with Talang fantomatique. But you get 20-30 more rare fishes in the same time and all the other stuff which is worth more than 2k gold. I didnt try all the zones and all the fishes so I cant say that this AP building is the best. But I can say it's better than Talang fantomatique. Have fun. Feel free to reply if you have anything else, that is not fishing with Talang fantomatique or Ancienne bague vrykule. A one button macro that switches between Pêcheur de Terradiance and Gueule-du-Damné. This allows you to easily switch between your Angler/Artifact when you hop in/out of water/combat. It's also setup for when you hold Alt, it will cast fish. Then the gold sink... i bought 30 Appât arcanique and pretty much all the lures. Totally u need to catch 18 fish. Noting the special cases..
Requin en colère étourdi cannot be traded. You'll have to fish this out. Use the technique noted in the third point to follow. Most of the lures are 300 - 700 gold each in the AH except for 2... Broche à talangs rouillée & Ancienne bague vrykule. These are much more expensive, and with good reason. While the other lures may get you 1-5 of the needed fish, these will give you almost 20! Considering each fish is worth 5 skill points (or 50 AP once you get the rod).. it is definitely worth paying more for these. If you get any of them for under 1.5k, buy out the AH! I have personally paid (and later earned) 3.5k for each of them. If you don't get a particular lure (not available or too expensive), don't worry too much. You can only have one of each lure in your bag at a time so when you get to the zone, don't use the lures you have. Just use Appât arcanique & start fishing. The game will automatically give you the one you're missing first. Same technique for getting Requin en colère étourdi, & later if you decide to fish for gold, you can target the expensive lure by fishing in the zone with the rest in the bag. DO NOT BOTHER SEARCHING FOR POOLS.. probably the most important time-saving tip i can give. I just found a convenient spot by the water and used the lures (unless of course there was a pool right where i was). NONE of my lures went to waste & not only did i catch at least one of all the required fish, I also caught a decent number of lures to put back on the AH. EXCEPTIONS: The ocean fish where you have to fish in the black barracuda pools. Also Broche à talangs rouillée & Ancienne bague vrykule where u have to fish in the pools that spawn. If you don't have water walking buy something like Draenic Water Walking Elixir for these two, since the pools spawn in the middle of the lake. At this pace, I managed to get all 18 fishes with my fishing lvl 595. I just bought a couple of Ancienne bague vrykule to complete the deficit (100 fishing points each). Once you have all 18 fishes and hit 800 in fishing... don't forget to /reload.. I spent 5 minutes wondering why the Perle lumineuse wasn't showing up. That's it. Done. I continued to burn gold on the two main lures to raise my fishing rod to 12. You can do so at your own pace as you please. This not only gives you the ability to track fish schools, but counts towards the achievement Chiffonnier which is part of the meta Pêcheur accompli for the "Salty" title. Killing birds with stones man....birds with stones. 2. A balance spec druid can buy the tome Tome de la nature : Battement d'ailes and learn Battement d’ailes which allows a crude glide ability that can be refreshed infinitely at no cost. By itself, Flap is a bit underwhelming and a good spell to break fall damage. However, In balance form and mounted, you can get a running start and click flap and become a makeshift hang-glider. This will allow you easy access to Adjurateur Margoss to fish up the Mana englouti ! Confirmed today, if u want to fish Perle lumineuse after 8.0 patch. You only need to have legion fishing 100/100.